Vlasta Švoger was born in 1966 in Zagreb where she finished primary and secondary school. She graduated History and German language and literature from Faculty of Humanities and Social Sciences, University of Zagreb, obtained a master’s degree in 2000 and defended doctoral dissertation “Hrvatsko liberalno novinstvo u doba revolucije – Saborske novine, Slavenski Jug, Südslawische Zeitung i Jugoslavenske novine (1848.-1852. )” in 2004. For several years she was teaching German and History in primary schools in Zagreb. Since 1st April 1995 she has been an employee of Croatian Institute of History on Department of 19th century History. 7th November 2012 she was elected to the rank of a research adviser. During July 1992 she spent time, as scholarship holder of DAAD, at University Justus Liebig in Gießen, Germany. 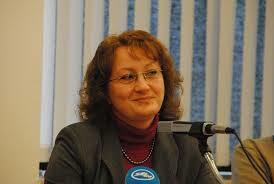 She cooperated on a few projects in Croatia and international projects Education of Church Elite in Central Europe. St. Augustine College for Diocesan Priests (“Frintaneum”) in Vienna as a Post-Graduate and Networking Institution of the Monarchy 1816-1918 and The Lexicon of Bishops from the Habsburg Monarchy 1806-1918. The main field of her research is political, cultural and social history of Croatia of the 19th century, especially Croatian journalism, position of the press and phenomenon of publicity in that period. For last few years, she has been researching the modernisation of Croatian school system in 19th century, especially its legal framework. She has published three monographs and more than forty scientific studies in Croatian and foreign periodicals and other publications. Moreover, she participated in about thirty scientific conferences and round tables in Croatia and abroad. She has been a member of editorial boards of several scientific magazines (Časopis za suvremenu povijest, Review of Croatian History i Povijesni prilozi) and is one of the editors on the project of Croatian History synthesis run by Matica hrvatska since 2007. She has been teaching the course “History of the 19th century” on Centre for Croatian Studies, University of Zagreb. She has been translating scholarly literature from German to Croatian and from Croatian to German. So far, she has translated couple of historical books. She was working on professional editing of historic terms for Njemačko-hrvatski univerzalni rječnik, Zagreb, 2005. She is also using English in her work. As team member Vlasta Švoger conducts archival researches in the holdings of the Vice-Roy’s Council and the Vice-Roy’s Government, periodicals and heirloom personal effects of renowned educators. She is one of the editors of the first volume of material on the history of the school system in Croatia. She also takes part in setting up the databases, preparing publication of the first and the second volume of material on the history of the school system, as well as on other joint project activities. She researches the issues of school legislation and intellectual transfer in the 19th century. “Zur gesellschaftlichen Rolle der Peregrinatio Academica in Banalkroatien um die Mitte des 19. Jahrhunderts – Beispiel des Kreises um die Zagreber liberale Presse”, Povijesni prilozi, vol 26, no. 32 (2007), pp. 259.-282. „O temeljima modernog školstva u Habsburškoj Monarhiji i Hrvatskoj“, Povijesni prilozi, 30, no. 42 (2012), pp. 309.-328. „Školstvo kao politicum: Opći školski red iz 1774.“ – (co-author: Ivana Horbec), Anali za povijest odgoja, vol. 9, Zagreb, 2010., 5.-47. „Početak modernoga srednjeg školstva u Habsburškoj Monarhiji: Nastavni plan za gimnazije (1849. )“ – (co-author: Ivana Horbec), Anali za povijest odgoja, vol. 10, Zagreb, 2011., 7.-15.